What is a Universal Asset Repository? 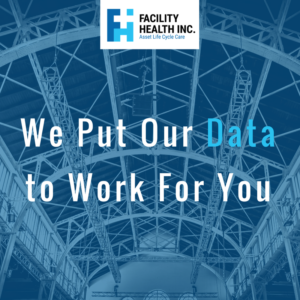 - Facility Health Inc.
At Facility Health, we know that maintaining your assets is your number one priority, but doing that effectively can be a challenge. Without the proper information, planning ahead and adopting a predictive maintenance schedule can be near impossible. So what’s the solution? We suggest using a universal asset repository. This is the “secret sauce” that sets our Dynamic Facility Condition Assessments apart. We begin by visiting your site and manually inspect your assets. Having boots on the ground is an important step, and lets us see everything firsthand. From there, we begin to catalog and filter each asset into the 250+ types we’ve classified. This will help keep them organized and allows you to take a step back and look at groups like “Air Handling Units” as a whole. Next, we begin investigating each asset more deeply. This is where the universal asset repository begins to shine. First, we compare each asset’s condition to vendor supplied information and industry data compiled by sources like AHA, RSMeans, and ASHRAE to establish a baseline on that particular piece of equipment. We’re looking for things like useful life and average cost of replacement. This allows us to give you data-based recommendations on things like when a piece of equipment is likely to fail and what your facility should expect to budget for. It’ll help you manage risk and see what’s coming down the road. This can be a boon for a complex piece of equipment like an Air Handling Unit. Clearly, it’s essential and with so many moving parts, knowing when to expect repairs or replacement gives facility managers the ability to plan ahead and avoid scrambling for extra funds and last minute maintenance. Another source of information we input into our database comes from our experienced engineers. They’ll collected large amounts of data during their years in the industry, and make sure a human element comes into the process of evaluating equipment. An additional input into the database we use is our own. We’ve apply the experience of our engineers. This helps us taking smaller details into consideration, like the fact that some climates can drastically affect the lifecycle of equipment. For example, an air conditioning unit will have a shorter useful life in a warm climate than a heating system. The opposite is true in colder climates. These differences may be hard to catch without a human touch. This second comparison helps us be thorough and refines our final recommendations. Overall, we’re going to give you the facts. Data-based recommendations are the only type we propose, and we’ve got a lot of hard numbers to back us up. We think the universal asset repository is essential and are excited to put it to work for you. If you have any questions, please contact us. Be sure to follow us on LinkedIn or Twitter for more information!